The Alabama Crimson Tide "15" Schutt XP Authentic Helmet is the same helmet college teams are using on the field. The helmet construction includes a full size shell made with Kra-Lite II Polycarbonate Lexan, painted team colors and shiny clear coated protective finish. Schutt installs snap out TPU interior padding with inflation points and a steel polyvinyl-coated face-mask. A 4-pt high hookup chinstrap, official team decals and striping (if any) complete the authentic XP helmet. Helmet measures approximately 13"(L), 10"(W), 10"(H). Not professionally fitted, unsafe for use or competitive play, and a "no wear" bar installed to further discourage wear. Schutt XP Authentic helmets are perfect for display, gifts, and for autographing - the ultimate way to show school spirit! 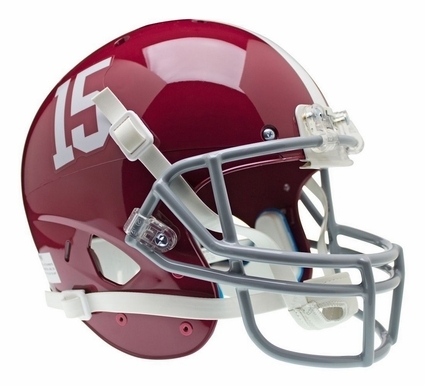 Get your Alabama Crimson Tide "15" Schutt XP Authentic Helmet today!